Home Our Garage Door Services Garage Door Springs When Should You Replace Your Garage Door Springs? In the majority of cases garage door springs repairs involve the complete replacement of the springs. Because springs counterbalance the door's weight they take the most damage during everyday use. They generally do their job just fine until they break. Even though this only happens once every few years, the regular lifting, as well as other factors such as weather changes, will weaken the springs and lead to malfunctions. When the door is closed, the springs should be tightly coiled together. However, when the door is open, the coils become separated for the spring to be straight. If you notice any separation of the springs when the door is closed, or any sagging when the door is open, it means that the springs have lost their torsion and retention ability and they need to be replaced. If you notice that the garage door spring doesn't work as it should anymore, it is almost certain that it will need to be replaced. Because the spring is under great pressure every day, it is actually dangerous to postpone the replacement. As a rule of thumb, springs break one at a time. When a spring is broken, the door will feel very heavy all of the sudden, and this is how you know something is wrong. This is a give-away sign that the springs of your garage door are in need of immediate replacement. If your door appears to be crooked, it's almost always because the one or all springs are broken. Sometimes, you can also tell that the springs are broken by looking at the actual springs and determine whether they look worn-out. If the springs look elongated or stretched out, they need to be replaced. The typical lifespan of garage door springs is generally a relative number, but the truth is the more you use your garage door, the quicker the springs will wear out. 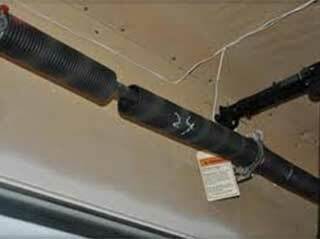 As a rule of thumb, a standard garage door spring has a lifespan of 10,000 cycles. This translates in approximately 7 to 12 years of use.